The Tool box entry in the Index contains a list of the palettes available that are available. To access a tool palette in the index, open the Tool Box entry in the index. To drag a palette to the workspace: move the cursor over the name, press the left button, drag the name to the workspace, and release. Tool palettes can be placed in binders together or separately. or use the Set options tool. Some of the tools in the tool box have options that can be changed. Options can be changed by either editing a text or by selecting a check box. For example, the default size of places can be changed by editing the options for the New place tool index entry which is found under the Create tool box. 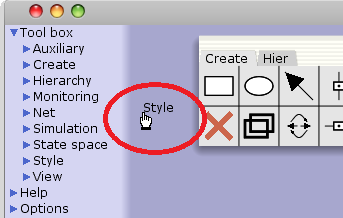 The options for a tool can also be found using the Set options tool which opens an index with the options for the tool. The Help pages for the individual tools describe which, if any, options can be changed for each particular tool. See, for example, the New place tool. Some options can be changed by editing text either in a tool cell or in an index entry. When the text is edited in one location, then the corresponding text is automatically updated in the other location, when you leave text-edit mode. 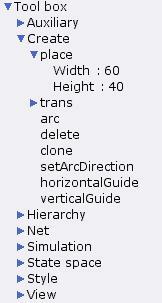 See, for example, how to change the options for the Create auxiliary text tool. The Set default tool can be used to return tool box options to their default values. The values of the tool box options will be saved when the workspace window of CPN Tools is closed. Note that the tool box options will not be saved if the console window is closed before the workspace window.